Every spring, prescribed burns are conducted on 15-20000 acres of forest in the Pine Barrens of New Jersey, United States. 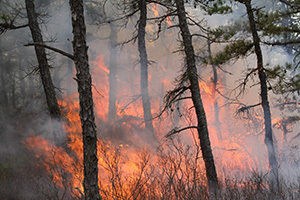 Historically, fire is a natural occurrence in the Pine Barrens and is an integral part of maintaining the ecosystem. Such prescribed burns are also used as a type of ‘fuel treatment’, aimed at reducing the fuel loading, the quantity of vegetation biomass, in the forest. The intent is that, by managing the accumulation of fuel, accidental wildland fires will have a lower, more manageable intensity, thus reducing both the potential risks to the community and the costs of firefighting operations. This is particularly important in an area like New Jersey, which lies in the middle of the densely populated coastline of the Northeast United States. In a three year project, researchers from the University of Edinburgh, in collaboration with the United States Forest Service and Rochester Institute of Technology, are attempting to better understand the effects that fuel treatments have on the behaviour of the fire itself. The approach involved experimental measurement of the fire during two high-intensity prescribed burns. On the 11th of March this year, the second of these was conducted, and the Edinburgh research team travelled to the United States to help set up instrumentation and observe the fire. Measurements of the fire behaviour included temperatures within the flames and plume, total and radiant heat fluxes, and wind speed and direction. A series of georeferenced aerial images, taken from an infrared camera mounted on an airplane, also provided a progression of the footprint of the fire and an indication of its rate of spread. In addition to the fire behaviour, measurements of the fuel loading in the forest were made both before and after the burn. This was done through a combination of field sampling and aerial, georeferenced Light Detection And Ranging (LiDAR) measurements, which allows for a 3-dimensional reconstruction of fuel loading in the forest canopy. These experiments will provide a greater understanding of the degree to which prescribed fire of a certain intensity is effective in reducing the fuel loading in the forest. Additionally the team will be able to study how the environmental and fuel conditions prior to a fire affect its behaviour, which has implications to true wildland fires. However, such detailed and involved experiments are rare, due to the high associated risk and limited locations which permit experimental studies. Therefore, these measurements are also being used to support the development and testing of detailed physical numerical models of fire behaviour. This work is the focus of the PhD research of a University of Edinburgh postgraduate student, Eric Mueller, under the advisement of BRE Chair in Fire Safety Engineering, Professor Albert Simeoni. It is the hope that these kinds of numerical models will provide safe and efficient supplementation to field experiments as well as a tool to support management decisions.